From a reader in Maine comes pictures of a Harry A. Bower field drum in a white finish with the American Legion Logo applied to the shell. More interesting is that this drum is reportedly one of EIGHT in a complete set which was at one time used to outfit the local Legion's drum & bugle corps. The drums have consecutive serial numbers in the very low 1100 range, an extremely high number for Bower. It is doubtful that he actually produced that many instruments even over the long span of time during which he was active as an assembler of drums. In the late 1920s Harry A. Bower relocated from Boston, where the Vaudeville scene was drying up, to California where there was a burgeoning music and entertainment industry. 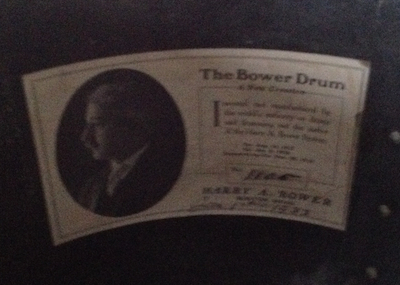 Most of Bower's drums date from the late 1910s and early 1920s which appears to have been the height of his success as a drum builder. He largely disappears from the manufacturing and retailing scene after about the late 1920s. The label inside of this drum appears to date the instruments to 1932 which would be very late for an instrument of this design. Bower's patented tensioning system was an odd one where both heads were tuned concurrently by turning the nuts on the side of the drum. The major disadvantages of this system were that the heads could not be adjusted independently, and that there was nothing holding the rods in place. Should one set of claws lose tension for whatever reason, the drums tended to literally fall apart! What makes these particular instruments so strange is that not only are they of an outdated design, but they were apparently produced well after Bower had left Boston and his musical instrument building operation behind. 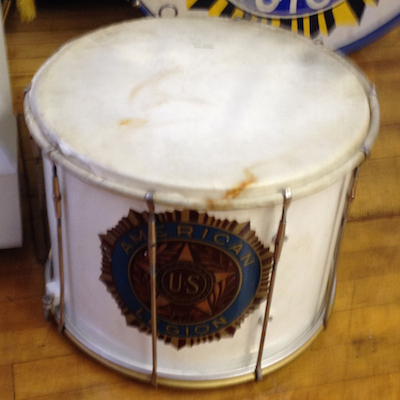 Is it possible that the parts for these drums were left sitting around back in New England where an associate was able to build out a full set of drums for an American Legion corps? Or did Bower take his remaining stock with him to California only to later sell them to an old connection back on the east coast? There are questions to which answers are not likely to be found, but it is interesting to ponder how Bower came to outfit an entire drumline in 1932.